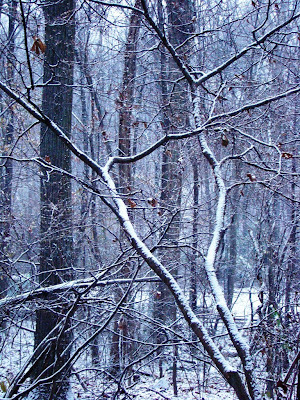 Today’s photo is the last of my "first snow" photos, and likely my last blog post for a few days. With the upcoming holiday, I’ll be doing holiday things for a day or so and then outdoor things for another day or so. I’ll be back to regular posts by Monday, perhaps earlier if the internet connection and time allows. 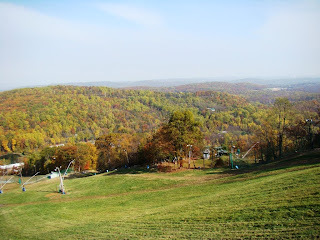 Roundtop will open for skiing this weekend, too, so I will be busy! And if I don’t already have enough to do, I’ve signed up again for Cornell Lab of Ornithology’s Project Feederwatch after a few years of not reporting my data. I enjoy participating in this project but when I’m pretty sure my winter will be too busy to do it justice, I don’t sign up. This year I’m not certain I’ll have enough time, but I’m going to try anyway. Activity at my feeders is starting to pick up. I have almost all my "regulars" in attendance this year. 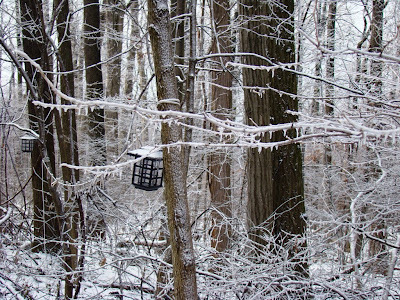 The only one I haven’t yet seen at the feeder itself is the Carolina wren that I hear singing down by the brushy edge of the woods. The rest of the usual gang pigs out every morning. In fact, I hear the titmice call as soon as I open the back door, announcing the arrival of food to the entire forest before it even hits the bird feeder. I’ve made an addition, perhaps a temporary one, to my bird feeding regimen. The local garden center is now selling mealy worms and I picked up a plastic tin (about 2 cups at $9.99) for my birds. They are thrilled, but since this is expensive caviar-grade stuff, my largesse may not last through the winter. I dole it out in palm-sized daily amounts. The rest of my bird food is the same: suet, sunflower seeds, thistle, safflower seeds and the "Woodpecker" mix of nuts and seeds from a seed manufacturer. This combination results in happy birds and little wasted food. Virtually everything is eaten, and there’s no millet involved. I have two tube feeders and a platform feeding station. I’d put out more tubes, except that the white oak tree over the feeders doesn’t have any other low-hanging branches to hang more from. The platform feeder actually hangs on my deck, not the deck railing but on a hanging iron plant stand that has a round base. I have to weigh the base down with stones to keep it standing, but it usually does keep standing, though sometimes a very heavy squirrel, leaping from some distance or just overly klutzy, will knock it down. That hasn’t happened, though, since I added yet another stone atop the base. So, I hope everyone has a happy Thanksgiving and enjoys a long holiday weekend. I’ll make sure the feeder birds get an extra helping of mealy worms for the holiday, and you go ahead and have that second piece of pumpkin pie, too. It’s okay. My snow photographs that I took on Sunday are outdated already. Last night I had almost half an inch of rain, so this morning the snow is gone. I am not surprised, really. This is November, after all. November is perhaps the most variable month of the year here. In the space of 24 hours I went from a morning low of 18 degrees to a temperature in the mid-40’s. I’d love to be posting a photo of the red fox that was sniffing around just 10-15 feet from the end of my back deck. But I was afraid if I moved to go get the camera that it would run off. At the time I was watching my bird feeders, where the activity is finally picking up, when the fox trotted into what would be my back yard if I had a yard instead of a forest. The fox nosed around, calmly checking out the territory with the aura of an animal who’d been there before. It casually looked under leaves, poked around sticks and branches. A couple of times it stopped and looked right towards me, and we made eye contact through the picture window. That didn’t bother it. It would just check every several seconds to make sure I wasn’t doing anything it didn’t like. Then it would go back to checking out the territory. At the time, it was perhaps 10-15 minutes before sunset. The sky was cloudy and already darkening but still light enough for me to watch the fox for several minutes. I wondered what it was up to. Then I remembered I had tossed a few apples that were past the point where I wanted to eat them out into the back woods for the local deer. After watching the fox, I’m thinking the deer never got them. The fox continued its activity, and eventually it got so close that I couldn’t see it any longer. I think it trotted under the cabin (which is raised several feet off the ground), taking the short cut back in the direction it came from. My guess is that it had one more stop before reaching its den. I’ve also seen it by my neighbor’s carport, where he keeps (and uses) his grill. I wonder if he knows?? I thought an arty-type snow photo of this pretty, old stone bridge along Beaver Creek would be a good addition to my early snow photos. The bridge and the dirt road beyond it is closed for all but private use, and I just love the look of the straight lane disappearing into the woods. But as is so often the case, once I got to the bridge, I saw something more interesting than a simple arty-type photo. Can you see it? Look at the bridge itself. Rabbit tracks hop along the length of it. The sides of the bridge are about 2.5 feet high, though they are somewhat sloped where the it starts. 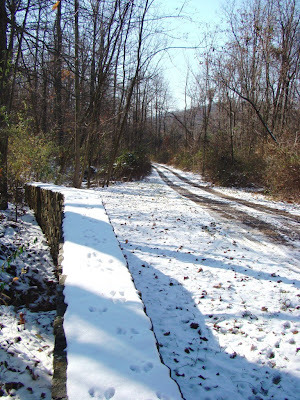 Sometime after the little mini-snow fell, a rabbit jumped up on the bridge and followed the wide stone side of it for the entire length of the bridge. What’s that about? This rabbit could easily have crossed the bridge and stayed firmly on the ground. Instead, it decided to take the route with a view. I can’t help but wonder why it did. What was going through that little rabbit brain? I would have guessed it would be more easily seen up there by the red-tailed hawks that patrol the valley. In any event, this particular rabbit followed the edge of the bridge, hopped off at the end and disappeared into where I didn’t follow. I am left with yet another of nature’s mysteries, one I will never solve. I enjoy the idea of a curious rabbit with a hankering to explore its world from a different point of view and taking the chance to do so when the opportunity presented itself. Snow! This is what greeted me when I stepped out of the cabin this morning. This truly counts as an actual dusting of snow, not a pretend dusting like I had yesterday morning. For most of this week the sky has looked like snow, and I’ve seen flurries and flakes almost every day. But since nothing much was coming out of the sky, I’d gotten out of the habit of expecting it to amount to anything. Then around 4 a.m. I woke up and saw into the forest from my bed. The woods looked light, almost as though the sun was soon coming up. I think it was this false dawn that woke me up. I knew as soon as I looked out that it was snowing. 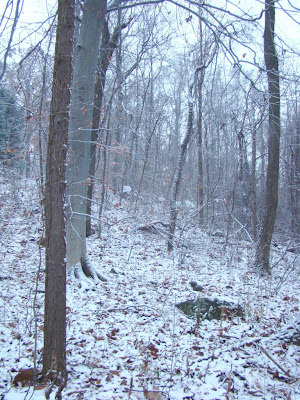 When it snows in the woods at night, the sky turns a pale shade of tin gray that I only see in winter. This is the snow sky, and as the clouds lower, they brighten the surrounding forest even before the first flakes cover the ground. 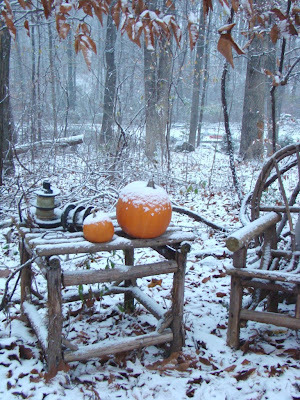 Later, after I’d gotten up, I could see the snow was heavy enough to coat the decks and this year’s leaves that fell only last week. The dogs even tried to run through the snow with their noses acting like a snow plow. That didn’t quite work. Maybe next time. 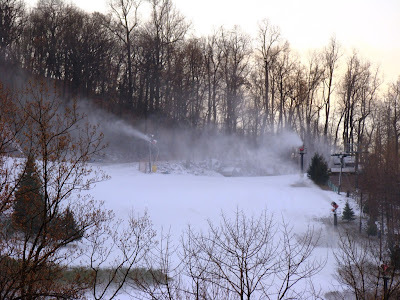 Snowmaking at Roundtop will start tonight, which will likely make the season’s opening sometime over Thanksgiving weekend, though it will be several more days before we can yet know a precise date. Winter is arriving, one little step at a time. I had a little bit of snow last night. As you can tell from today’s photo, it was a really little bit. I don’t think it’s enough to call it a dusting, though it would have dusted if I’d had a bit more of it. The biggest news about this little snow is simply that the ground here on Roundtop is now cold enough for the snow to lay there and not melt the instant a flake hits it. One step closer to winter. Actually, the entire year is a series of these little tiny steps, one step closer to this season, one step further from that one. Occasionally, the steps moving closer or further from a season are big ones, but that’s not the most common way a year turns. Usually the steps are tiny, and sometimes they are almost too tiny to notice. I’ve always loved looking for these tiny steps. I hate it when I don’t notice a change until it’s such a big one that it slaps me in the face. Those make me feel as though I’ve been asleep at the switch and probably deserve that slap. They also make me wonder what else I’ve missed. Sometimes in our daily lives, nothing much does change, so it’s easy to get lulled into not noticing little changes anywhere around us. The furniture is still in the same spot it was yesterday. The car is the same one you’ve had for years. We get out of the habit of looking for change. The natural world reminds me that change is always happening, and those changes are noticeable if you take a few moments to look for them. Paying attention to the little changes around me usually makes the bigger ones seem less of a surprise. I can see them coming. Last night snowflakes swirled around the cabin for several hours. The flakes were enough for me to count them as an actual flurry. 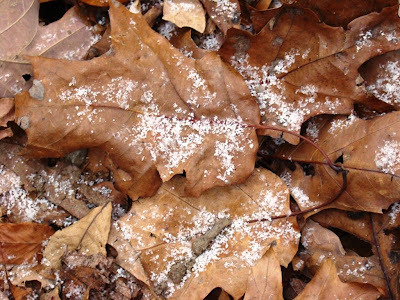 Last week I had a few flakes, too, but you had to be on high alert to be quick enough to see them. Not last night. 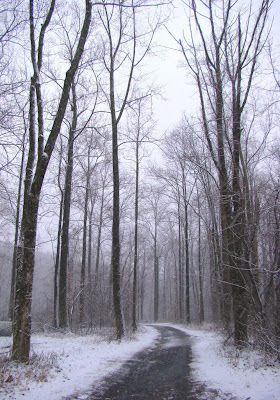 The flakes tickled my face and were thick enough to obscure the more distant trees of the forest, if only briefly. Perhaps that little bit of snow is what feeds the restlessness I feel. I am not the only one to feel it, though. 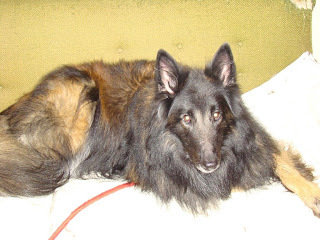 The dogs misbehave in the crisp weather and seem to have a renewed energy they can’t contain in good behavior. I am impatient when chores or work force me to stay inside and don’t seem able to settle until I am outside. And then I have to force myself to stay in the moment and not let the cares of daily life intrude on this precious time. Sometimes I never do slow down. I can’t find that comforting groove where the minutes seem long and precious, and each moment is an experience to treasure. I try to let it go, that restlessness, that urge to hop to the next chore or the next thought. Sometimes I am successful. And sometimes I swirl like the wind-tossed snowflakes and never alight. 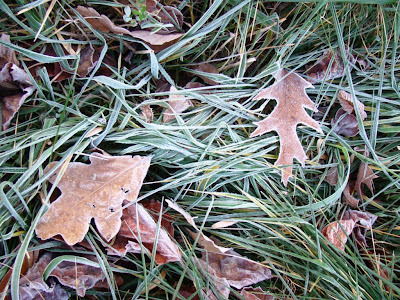 Since I started this blog a few years ago, I’ve posted a "frost" photo at least once each fall. Here is the one for 2008. It’s been cold enough here for a frost multiple times this year. However, each time it was cold enough, it was also dry, so there wasn’t much to see. 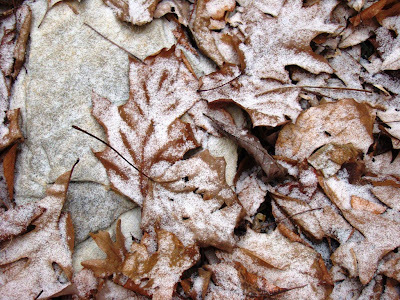 This morning, though, the frost was on the grass and fallen leaves and drew my eye as I was leaving the cabin. I finally had a northern cardinal at the feeders this morning, so I am relieved that they are still around. So far, I’ve only seen one male and not the multiple pairs of last year, but that may well change before the first snow flies. I’ve also seen what I’ve suspected for some time: I have at least two male red-bellied woodpeckers at the feeders. Today was the first time I saw both at the same time to confirm that there are two. 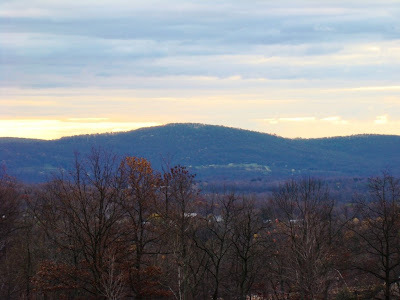 Roundtop hasn’t yet made any snow, but I wouldn’t be surprised if they began doing that before this week is out. I’ve been working down at the lodge for the past few weekends now doing the usual pre-season work. That always gets me in the mood to see snow on the mountain (and at the cabin!) again. I do have hopes that this year might actually be a real winter here. For the first time in 7-8-9 years, there’s no El Niño or La Niño effect to moderate the weather, so I’m cautiously optimistic that this year might be a good one. I hope so. I’m ready (I hope). 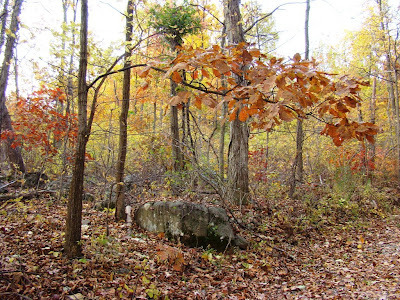 The annual nature show called autumn is officially over here on Roundtop. 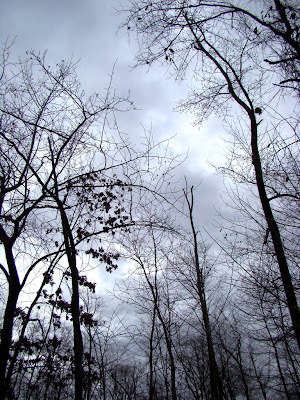 All the leaves are down (and brown, too) and the sky is gray. This time of year is often challenging to photograph. Colors are limited to various shades of brown, and the light is so variable that what looks gorgeous one minute turns dull and drab in the time it takes to raise the camera to my eye. It takes me a while to adjust after the brilliance of just a week ago. My outdoor forays were unusually limited this weekend. Heavy rain kept me inside most of Saturday, and the tornado watch kept me with one ear focused the radio much of the time. Sunday boasted gale-force winds much of the time, and those doesn’t make me want to rush outside and play. So I spent an inordinate amount of time inside and watching the birds at my feeders. The new bird-feeding season is starting out quite a bit different than usual. So far, I haven’t seen a single northern cardinal. Usually I have 4-6 of them. Are they gone? Are they still finding food on their own? So far it’s a mystery. I also haven’t seen a Carolina wren this fall feeding season, though it’s possible I have simply missed them. They were never the most regular of my visitors. The rest of my diners are pretty much the usual suspects, though titmice and chickadees of both the Carolina and black-capped variety seem a bit more abundant than average. The white-breasted nuthatch is furiously defending the feeder from all but the bigger birds—like the blue jays and red-bellied woodpecker. I haven’t actually seen the downy woodpecker in the feeder yet, but it is feeding on branches all around. Yesterday I had the first goldfinch that I’ve seen. It ignored the thistle tube (perhaps because of the wind) and fed in the platform feeder instead. So far, I have had no unusual suspects at the feeders, but the season is early yet. 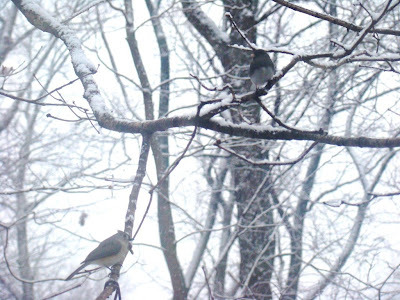 Once the first snow dusts the mountain, I typically get all sorts of birds who ignored the feeders before the snow fall. 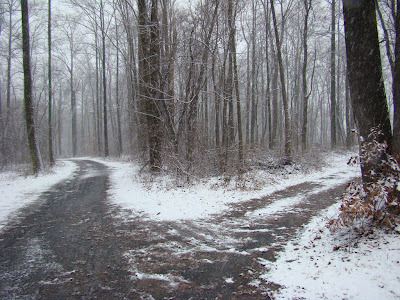 Last night, snow flurries tickled my face as I walked the dogs after dark. It won’t be long. Today's photo is one I took only a litte more than a week ago. Today, the same view is barren of leaves, with just a few brown stragglers hanging on. 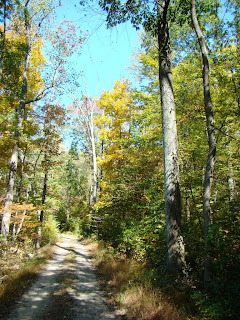 To me, it feels as though the forest takes forever for its color change to progress past the first few leaves. Then the blaze of color that is so breathtaking is gone within a day or two. Blink and you miss it. Even if you don't blink, it's gone quickly. Some of these same leaves, no doubt, now fill my rain gutters and cover both decks. Leaves also find their way into the cabin, hiding under the kitchen table or sometimes right out there in the middle of the living room. Every time I open the door, one or two of them trails in behind me and the dogs, like stray puppies who are determined to adopt you as their family. The leaves are everywhere and get into everything--just like puppies. The other day I found one atop my bed, and I'm still trying to figure that one out. Maybe I can blame it on the cats. 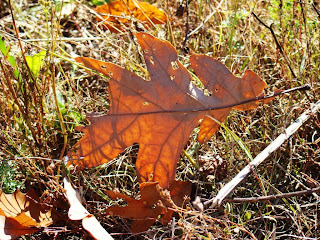 Should I have a dry winter, the leaf problem will remain with me throughout. Rain weighs them down, but as soon as the surroundings dry again, the leaves are skittering back into the cabin. Snow is the best thing to stop their constant parade. Once covered by snow, they become earthbound, usually for good. 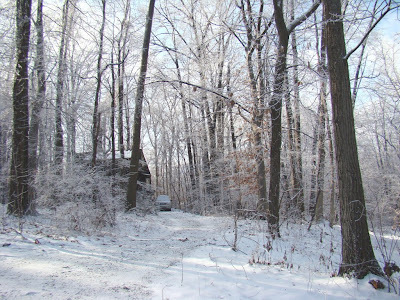 By spring, after three months under a snowy blanket, the composting process is well underway, turning last year's leaves into good soil to sustain the forest and foster new growth. The cycle will then start all over again. For now, I just need to clean the rain gutters. 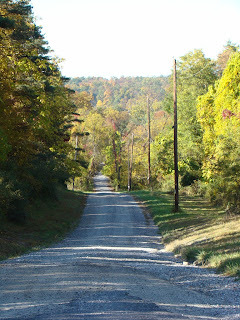 This photograph was taken on Sunday afternoon looking up the road past my cabin, but already the photo is "ancient history." The color is gone. Indeed, the leaves are gone. The only shade left on the few remaining leaves is brown. Sometimes I’m shocked by just how fast the forest around me can change. And yet, this view is also a glimpse of a truly ancient history. Leaves fall every autumn. Every autumn. Every year. The trees that line my lane are older than I am and will live long past my own span. The trees that cover this mountain are the direct descendents of trees that have covered this mountain for untold lifespans of other humans and for untold eons before humans first set foot here. They are a living link back into the dimmest days of the pre-history of our planet. When I look at them, I can imagine the first humans who walked here. I can imagine a forest before people ever stood here. 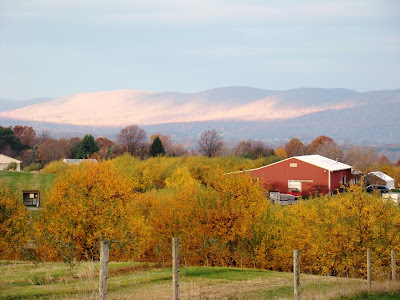 I can imagine the change of seasons and the quiet that then covered these hills. Nothing else can tie us to the past as directly as the trees. Fossils of formerly living creatures are now simply interesting stone imprints. But the trees are living reminders of what has gone before. A reminder I can touch every day, a reminder that changes before me every day, a reminder that teaches me every day what history really is and that today is only today. I'm away from the computer today, so I thought I'd leave you with just a photo. I like how the tree limb is bending gracefully over this boulder. It almost looks sheltering. I took today’s photo on Monday morning as I was leaving the cover of the mountain. The view is to the west, of the range across the valley. I was taken with how the morning sun basked the range in light under a cloudy sky. Last night I drove back to the cabin after dark, under the light of a clear sky and nearly full moon. A white-tailed deer calmly trotted from the edge of one of the snowmaking ponds, across the driveway in front of me and into the edge of the woods. I stopped to let her pass and watched her walk towards the woods. She didn’t even raise her tail in alarm. Then I saw where she was heading; two other deer, already curled up and laying down in the leaves, were not more than 20 feet off the road. 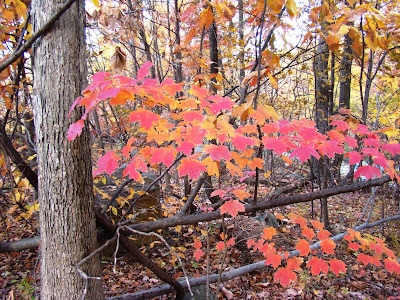 They were as brown as the leaves and nearly invisible among them. They were unconcerned as I drove slowly by and didn't even stand up. One twitched its ears. They looked perfectly comfortable on their leafy mattresses. I didn't linger but inched by slowly. I hope I didn’t disturb them. They looked so comfortable. I don't think I did. 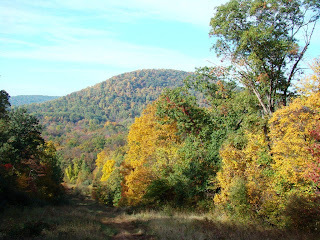 This is the last photo I will post of good fall color around Roundtop. The leaves are nearly all down today. 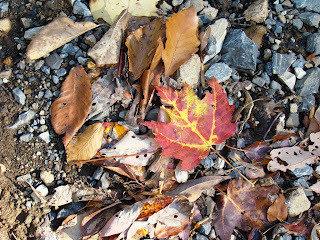 A few days with a slight breeze was all it took to take the leaves from good color to brown to on the ground. And in just that little space of time, suddenly I have lots of natural light at the cabin! Even on a cloudy night, as last night was, it seems almost bright at night because I can see the sky. I look forward to the falling of the leaves every year simply because I enjoy the added light so much. The leaves are ankle deep on my decks, even though I swept them clean both days of the weekend. By the next morning, it didn’t look as though I’d done any sweeping. If there’s one constant about living in the woods, with the forest coming right up to the doors, it’s that I will never get ahead of the leaves. 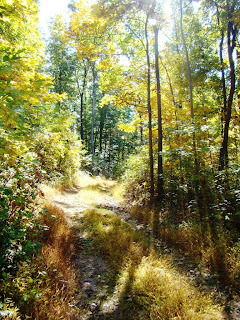 This morning as I left the cabin, I waded through the leaves again. If I hadn’t swept them off the decks, I would be shin high in leaves. And that could happen before the end of the week, as I have a busy week ahead and will likely not have much time to spend at the cabin, let alone time to sweep the leaves. You might think that once the leaves are down, my leaf sweeping regimen would end. That’s not true. As long as the leaves are dry, the slightest breeze will toss them about, and somehow they will end up on the decks again. It’s only when the leaves are wet or buried under snow that they’re not finding their way onto my deck. Sweeping leaves is not nearly as bad as mowing grass, at least in my mind, but it’s also something that needs to be done more frequently and for longer during the year. That doesn’t mean I’d prefer mowing grass. Not at all. Not for a moment. As much as I like the weather of the cooler seasons, I also find it a bit frustrating sometimes. Here I am living in the woods, amongst all this beauty and natural life, and I don’t get to see it very often right now. In the evenings, I’m racing to get home while there’s still some light in the sky. Lately, I haven’t been making it. The sun is already behind the mountain, and woods around me are the monochromatic colors of dusk by the time I pull into the driveway. The birds are already quiet and roosting. In the mornings, it’s not much better, especially on these overcast mornings. When I’m lucky, the mornings are not too early for the chickadees or the titmice to visit the feeder, but I get to see only a few of them before it’s time to head to work. It’s certainly too early in the morning for me to see the feeders when they are their most active. And I know the birds do show up eventually because the feeders empty so quickly. It’s frustrating to live here and yet still not be able to spend much time in the woods or even see what’s in the woods much during the week. I can’t imagine how much greater my frustration would be if I lived in a town or a city where I would have to travel just to visit where I live. 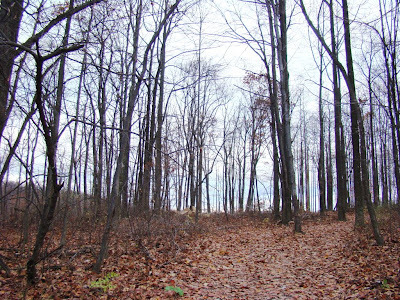 During this time of year, when the hours of daylight are short, even attempting to visit a natural area during the work week would be out of the question for a city dweller. So is it any wonder that so many people are nature-deprived? 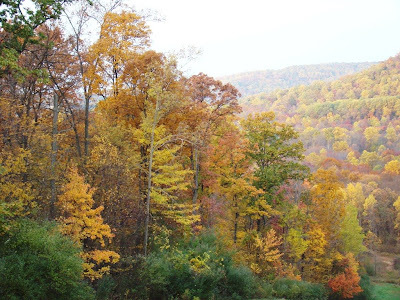 It’s not just children who suffer from a "nature deficit disorder." Some days, even I feel that way. 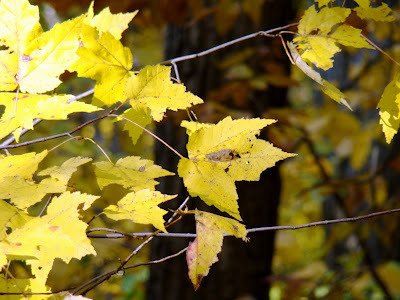 Autumn leaves around my cabin come in all colors, though yellow is the most predominant. This year, there’s a healthy dose of orange in there too. Red remains the least common of the colors I see. Since Sunday, when I took this photo, the colors are already fading. Oh, the brilliance of autumn lasts too short a time. Overnight, as I lay in bed trying to fall asleep after staying up too late to watch election returns, a little sprinkle dampened the woods, and the leaves started to fall, more with each drop of rain. Sometimes it didn’t even take a drizzle or a breeze. 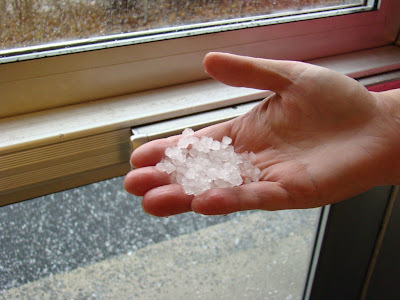 They just dropped, waflting past my bedroom window, slowly falling to the ground. It was simply their time to go. In another few days, a week at the most, they will all be gone. I love winter and look forward to it each year with all my heart, but I will miss the brilliant colors of autumn and wish they would stay just a little longer. I took today’s photo on Sunday morning. This spot is about 100 yards behind the cabin. 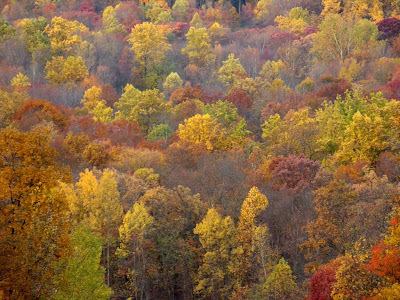 I can’t see this view from the cabin as the leaves are still hiding it. Nell’s Hill is the closest hill. The further hills are the next range across the valley. Just two days later the colors are already fading. The next half-decent rain or bit of wind will bring them all down. Waterfowl migration is ongoing right now. I saw three buffleheads on the new pond the other day, an uncommon species here on the mountain. It’s only since the new pond went in that I’ve gotten to see a few species of waterfowl on the mountain, other than a few lost souls once or twice a year. The new pond has been great for my "yard" list of birds spotted on the mountain. I pretty much reached the limit of seeing the woodland species that show up here years ago. Several years passed without seeing any new species until the new pond was built. So now, my local list of birds seen on the mountain is inching up again, and if it’s moving at a glacial pace, at least it’s no longer static. 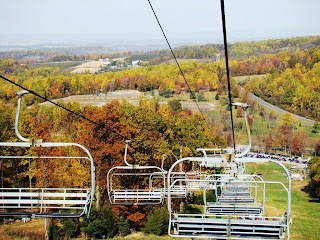 I don’t often get to ride the ski lifts on a pleasant fall afternoon, but I did this weekend. Roundtop was holding its annual ski swap, and one of the ski lifts was open for rides. The fall color was past the peak of brightness, but it made up for that with every leaf on every tree now showing color. Saturday was a tad hazy but the views were still great. Riding the ski lift is fun, and the round trip only took about 15 minutes. A lot of people rode the lift up the mountain and then opted to walk down, but I can walk down the mountain any day I want to, and I was hoping the added elevation of the lift would allow for a slightly different perspective on the views. The leaves have arrived at the point where the next rain or decent wind storm will bring down almost all of them. Tuesday and Wednesday shows a chance for drizzle, which probably won’t be enough to do the trick. Saturday might bring a storm strong enough to do it. I’ll keep hoping. Each day more and more juncos arrive, though they either haven’t found my feeders yet or they’re not yet hungry enough to want to visit the feeder. Right now I have only the forest regulars—titmice, chickadees of both the Carolina and Black-capped species, white-breasted nuthatch, downy woodpecker and red-bellied woodpecker. For some reason, I haven’t yet seen a cardinal at the feeders, and the goldfinch have been ignoring the thistle as well. Likely, that simply means that they are all foraging well enough in the woods and don’t need the food from my feeders just yet. They will return soon enough. Last week I told you about a free hawk silhouette guide. This week I'm pointing you to a new free PowerPoint presentation on hawk identification. The presentation is about 30 minutes long and available free for download for non-commercial use (if you have high speed internet access) here at the Web site of the Hawk Migration Association of North America (HMANA). If you don't have high-speed internet, you'll need to order the CD for $12. The slide show is called Identification of Raptors of the Northeast and combines photos and graphics to show how hawks really look as they appear in flight and during migration. We all know that hawks on the wing don't look anything like poses in a field guide, and this presentation will help you identify the birds as they really look. The program covers 19 species of hawks and vultures, and first focuses on how to identify the major raptor families so you can narrow down an identification. Then it zeroes in on the field marks and flight patterns that will identify each species as they look in flight. 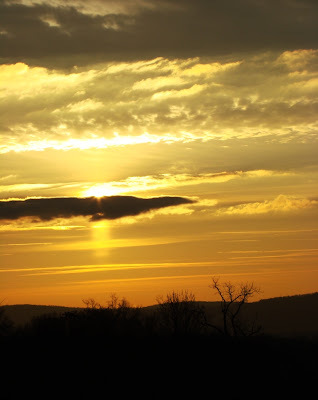 The program was created by Susan Fogleman from Little Round Top hawkwatch in New Hampshire. I was one of the early "beta testers" and think it will be very useful for novice and intermediate hawkwatchers alike. Plus, it's a fun prgroam, and I think you will enjoy it. This morning I saw three dark-eyed juncos, marking the first time this year I’ve seen more than one at a time. The morning is dawning clear, after several days of clouds and three types of precipitation (rain, sleet and snow), but it’s still almost dark when I leave the cabin. That will change in two days when we "fall back" an hour’s time this weekend. The mornings still will likely not be light enough for a photograph, but maybe I’m wrong about that and it will be. Now that this big nor’easter is past, I’m expecting that the next day or so will be particularly active around the woods. Hawks and songbirds both migrate heavily after big storms. Their migration is bolstered by a backlog of birds waiting out the storm, plus the storms apparently focus the birds’ attention on heading south. If the weather is good and food supplies are decent, they will hang around in their summer grounds and not feel the urge to move. It may well be another good year for winter finch irruptions to the south. Hawkwatches are reporting huge numbers of pine siskins, especially, moving south over the past week or so. A few hawkwatches have counted 1200-1500 each day. Ron Pittaway has posted a detailed winter finch forecast here on e-Bird that focuses on the abundance of far northern food supplies as the predictor for each individual species. Locally, some red-breasted nuthatches have been reported already—none at my feeders yet, where the action is still limited to the local birds and activity is just starting to pick up. The prospect of seeing northern finches is always exciting for me. Last year was a good one for me with redpolls, purple finch and red-breasted nuthatch all showing up. I know that these birds are down here because they’ve had a rough year up north, but if they come south, I promise to feed them well, so they will be good and fat when they head back north in the spring. The wind that has dominated here is finally easing. Yesterday was the most intense—45-55 mph winds for much of the day. I lost power at the cabin several times, each time briefly. I can’t drive up the driveway and down the lane without needing to stop at least once or twice to remove a branch too large or too gnarly to drive over. More juncos have arrived, though still not huge numbers of them. That might well change in the next few days. Once this nor’easter clears, those little snowbirds may decide they’d better clear out of Canada and head south while the gettin’ is still good.. The Canadian robins have also arrived. When I was a youngster, these were called "woods robins." These birds are a bit larger and browner than the birds that summer here (and which left about a month ago). Down here the Canadian robins tend to stay in small flocks and often stay throughout the winter, especially if the winter tends to the mild side. They don’t hang out in fields and yards like the summer robins. They prefer woods and sometimes abandoned fields. We used to think that "woods robins" were simply summer birds that didn’t migrate, but over the years research has shown they are really Canadian robins who have migrated, and after a trip of 1000 miles or so, they have flown south. In general, though, I see few of the forest’s animals in weather like this. They are as hunkered down as I am, waiting for the raging weather to abate. The snow that fell in the Poconos missed me. I was on the southwest edge of the storm and so got the worst of the wind instead. It’s a bit early in the season to have what is essentially a winter storm of such strength. This year will be the first year in what seems like forever to me where there will be no El Nino or La Nina effect to warm the winter. That doesn’t hurt my feelings at all, though I reserve the right to change my tune if I’m snowed in for longer than a week. Maybe I had a few flurries of snow last night. Mostly, though, nothing fell from the sky. Wind dominates my landscape at the moment, dropping ever more leaves from the trees. The wind will likely ruin the peak of fall color around me. The leaves will come down before they turn brilliant. Ah, well, such is life. Last evening Dog and I took a spin around the ponds. Walking in the evenings now is turning into a race with sunset. The evening was the kind of weather I think of as a true October sky—angry dark clouds, crisp temperatures, a wind that bites. Usually, I don’t have to wait until the end of the month to experience that. This October has been rather normal for its temperature—an improvement over recent years---but it has also been unremittingly clear with days on end of cool, windy days and blue skies. Much of the northeast has been the same. All I have to do is read the hawkwatching "dailies" to hear the complaints of counters suffering from "blue out." Blue skies are the bane of hawkwatchers. The undifferentiated sky is both hard on the eyes and makes it hard to see or even spot migrating hawks, who can fly much higher than they can when a little cloud cover holds them lower. Looking at teeny tiny little dots is not my idea of good hawkwatching. I’ve reached the age where I simply can’t hawkwatch in blue sky anymore. If I do, I won’t be able to drive home or walk down off the mountain. So last evening Dog and I walked and then simply sat, enjoying the weather. He wandered off after a few minutes, nosing the ground and then he started to roll. Now, if you own a dog you know this is not a good sign. I was up in a flash, pulling him off his rolling spot, but it was already too late. He’d found some fox poop to roll in. And he stank. So I took him for another run, hoping to blow the stink off of him, at least a little. Eventually, I couldn’t put it off any longer, as darkness was closing in. My evening was spent giving a doggie bath—not how I wanted to spend my evening. And Dog wasn’t pleased either. He loves water, but he can do without the soap. Wind blew across the mountain all weekend. On Saturday, it was rainy and windy. On Sunday it was sunny and windy. 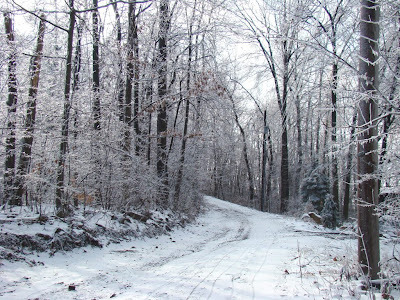 When I returned to the cabin after running errands, I had to stop the car, get out and pick up branches before I could get up my lane and back down my driveway. 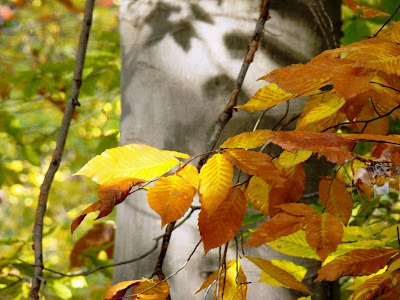 The wind blew mostly from the northwest, though even that swirled around and tossed leaves in many directions. 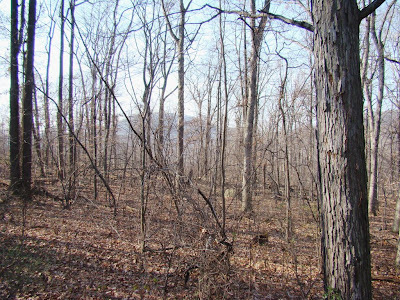 I spent much of Sunday afternoon out in the woods. 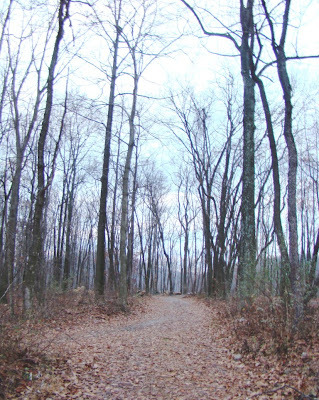 The sound of the wind was with me every step of the way, blocking out any other forest sounds. 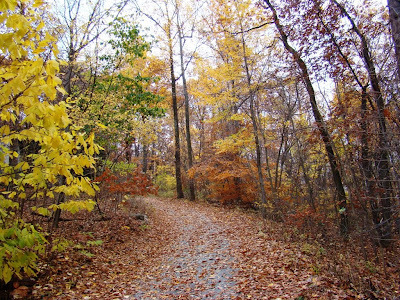 Missing was the usual sound of squirrels scurrying or deer trying to step lightly through dry leaves. I felt hampered by the loss of that sense, forced to rely solely on sight to notice what was around me. That made observation more difficult than I would have guessed. 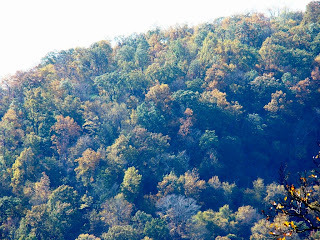 My eye was drawn to motion, which meant I saw a lot of leaves blowing across the mountain. Normally, I rely on hearing to alert me to something interesting and then follow-up with looking towards the sound. Deprived of hearing, suddenly everything caught my eye. That turned out to be both fascinating and frustrating. 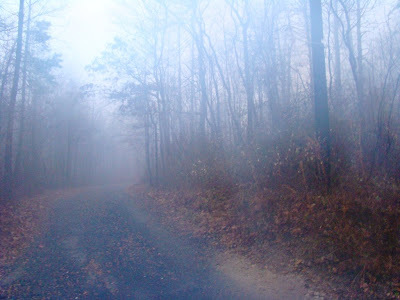 Even in ways I don’t expect, a few hours in the woods teaches me yet another lesson, one that I wouldn’t have experienced if I’d stayed inside. My inside environment, even in a small cabin, is a controlled one. Outside I don’t control anything, and I must react to what’s around me, whether it’s wind or sun or a herd of deer. That’s yet another reason why being in the outdoors is so different than working in a business or sitting in a house. That façade of control that we humans seem to value so much is torn away, even about little things. In the outdoors, you have to let go of that, if you really want to see and experience what’s out there. 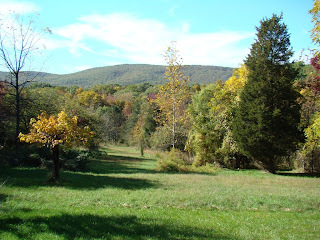 For weeks, the weather here on Roundtop was crisp and clear, with low humidity and no rain. This morning the moon was veiled with high cirrus clouds, and by the time the sun rose, I could feel the moisture in the air. I had frost this morning, and I smelled the sweet, sweet fragrance of snow in the air. The coming precipitation will not, however, fall as snow later today. The clouds will thicken with each passing hour and cause the temperature to rise. Rain will fall tonight or tomorrow. With the rain, many of the colored leaves of autumn will fall too. When the rain is over, the leaves that will remain will be those few that haven’t turned color yet, and for a few days the mountain will likely look green again. In a few days, another, this time the final round of color change will begin. Winter is coming. I've smelled it. If you’re anything like me, you likely have a bookcase full of fieldguides in your house. And though you may have started with a fieldguide to birds or trees or mammals, somehow, inexorably, over the years you’ve added fieldguides on subjects you never would have guessed you would own back when you got your first one. Some fieldguides are very complete. Birds are a good example. Many now show females, males, juveniles, inter-grades, hybrids and other plumages. As a result, if you get a good look at the bird (which of course it feels like something that rarely happens) you can probably identify it. Other fieldguide topics are less satisfying, I’ve found. 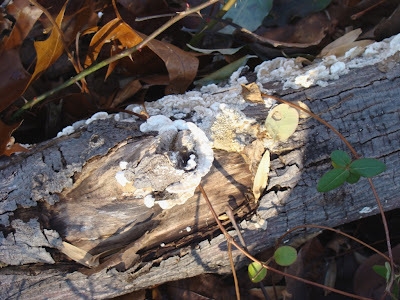 For something like fungi, for example, there are so many species that authors are forced to make selections about what species to include. So they look at the various habitats in the U.S. and then choose the most common species found in those habitats. But there you are, out in the woods somewhere, new fieldguide in hand, fungus (or fern) in front of you and you can’t identify it. Isn’t that a bummer? I can’t really fault the authors of those national guides. With thousands of species, they simply have to make choices. Especially with plants and insects, the number of species found in just a single state will fill the average number of pages of in a single fieldguide. That doesn’t make it any the less frustrating for the rest of us. A solution, I’m finding, is to search for fieldguides specific to the state or region where you live. In the bad old days when you were lucky to find any fieldguide for just mushrooms, say, regional fieldguides rarely existed. But now they are much more common, and even if you can’t find a guide to your state, it’s usually possible to find one for the state or province next door that will be better for you than a national guide that tries to cover a little bit of everything. The regional guides will certainly include more of the uncommon species in your area than is possible for a national fieldguide to include. And so while I can’t guarantee that you will be able to identify that odd fungus or fern or wildflower you’re sitting in front of, those regional guides will increase the odds you’ll find out what it is. About 3 miles from me was another earthquake on Sunday. I heard this one measured 2.6. I didn’t feel it. The dogs didn’t howl either. One person reported a crack in the foundation of their house. Another reported a broken window. Until 2 weeks ago, the last earthquake in this area was 10 years ago. But in 2 weeks there’s been 2 earthquakes. Geologists are telling people that these little tremors—the first was a 2.0—don’t mean a "big one" is imminent. Locally, people aren’t ready to agree. The second one was stronger than the first, so these might be "foreshocks." An "aftershock" is always weaker than the main earthquake. People are reporting hearing a loud boom coming from underground that is soon followed by a tremor. It’s because of the "boom" that people called the police, thinking it was an explosion or a dynamite blast. There is supposed to be what’s been described as a "small" fault line through the area, somewhere. No one, not even the experts know exactly where. It doesn’t even have a name, so far as I’ve been able to learn. The geologists estimate the quakes are about 5 kilometers below the surface. 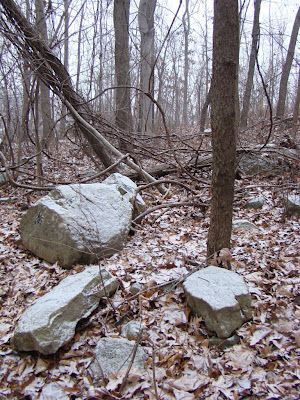 Unlike in California, the rocks in this area are old and cold and rigid, so they don’t really cut loose very often. There hasn’t been a really big quake in the eastern U.S. for the past 100 years. That one was impressive, though—an 8.0 that was felt 500 miles away. In this area, the last "big" one was somewhere between a 4 and a 5 in 1988. I didn’t feel that one either. That's probably a good thing. Sorry I was offline unexpectedly. Partly I was away and partly I had internet access issues. So I'd better catch everyone up on what's happened in the past 3 days. 1. I've seen the first dark-eyed junco (Sunday). It was only one, no doubt a scout. The timing for its arrival is just about average--2 days earlier than in 2006 but 9 days ahead of 2007 (which was late). 2. The nights are now falling into the upper 30's. 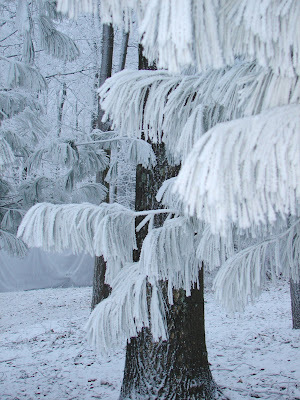 I have had a frost. 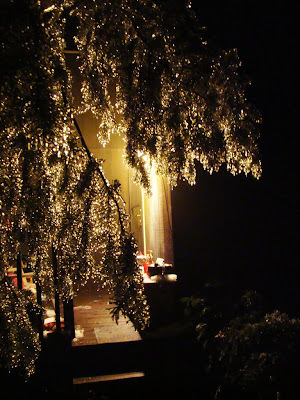 Neighbors in lower areas have had a killing freeze. It's chilly enough this morning that a front moving through could, theoretically, bring some snow flurries--except that it's been so dry and the front is so weak that it's unlikely any precipitation will reach the ground. 3. Action at my feeders is starting to pick up. I haven't had anything unusual yet, just the usual suspects: Red-bellied woodpecker, downy woodpecker, hairy woodpecker, black-capped chickadee, Carolina chickadee, tufted titmouse, blue jay, white-breasted nuthatch. I haven't seen a red-breasted nuthatch yet, though several have been sighted nearby. 4. I have a very annoying grey squirrel at my feeders. I've been wondering why the seed is disappearing so quickly when the feeder action is still kind of limited. Now I know. Jabba the Hut of a grey squirrel sits in the middle of the feeder, lazes back on his haunches and stuffs himself. 5. The leaves continue to fall (hooray!) and I can now see just a teeny little bit of the very top of the mountain to the west of me. Okay, so it's not much yet, but my view is beginning to return. At this point, I'd estimate that about 20% of the leaves around me have fallen. Winter is coming! Hawk silhouette guide for free! The Hawk Migration Association of North America and The NorthEast Hawk Watch, a regional chapter of HMANA, have partnered to distribute a silhouette guide to hawks of the eastern (and most of the central) U.S. The guide is available for free Here as a .pdf file for non-commercial use. If you like the guide enough to want a laminated version, we're going to charge you $4. You can order that one here. The artist is Paul Carrier, who for many years was the artist who created all the drawings for our journal, Hawk Migration Studies, of which I am the editor. Eventually, the journal went to photographs instead of drawings, but I will always have a soft spot for Paul's fine drawings. The silhouette guide is 2-pages and shows hawks as they appear when soaring overhead, which is how most hawkwatchers see them. I can still remember the first time I saw a Cooper's Hawk sitting on a wire, years after I'd started hawkwatching and years after I was comfortable identifying them in migration. I couldn't identify the thing. It wasn't flying. For most people, though, identification works in just the opposite way. They see something sitting and identify it in a fieldguide. Then if they go hawkwatching, they end up being flummoxed, because birds they can readily identify sitting someplace look entirely different on the wing and (usually) overhead. So this guide is designed to identify hawks when the only field marks you can see are the ones on the underside of the bird. There's also a little text to describe what to look for and views of the birds as they are heading directly at you. You will also find see the difference in hawk shapes among the major families of hawks. The drawings are excellent--more of Paul's great work--and I highly recommend the guide. And after you've downloaded the guide, why not take a look around the HMANA Web site at http://www.hmana.org/ and see what else we have there. 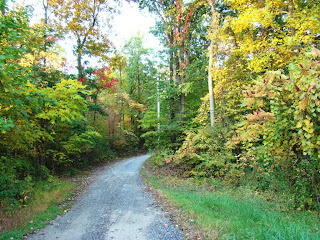 The photo today was taken last Sunday and shows the lane heading up to my cabin. The color has changed a lot this week. I'll have a newer photo of it on Monday. 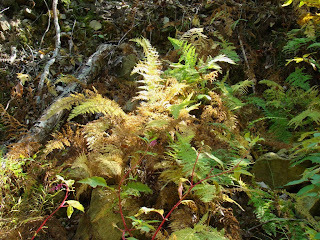 Even the ferns are turning color in the woods right now. I came across many of these colonizing a steep bank on my Sunday walk. These are the Lady fern, one of the most common in northern temperate climes like mine. This fern was much prized by the Victorians during the Victorian fern craze. 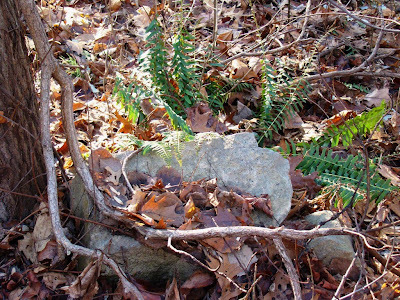 This species is probably the most common fern species I see around Roundtop. 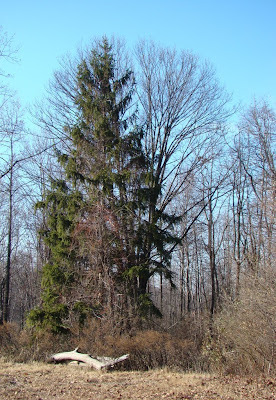 I’ve read that I could divide a plant in the spring and replant it up at the cabin, but I have an aversion to taking anything I find in the forest. That doesn’t keep me from being tempted, at least occasionally, though. Of all the plant families, I think ferns are my favorite, though fungi are close. Often, identifying ferns isn’t a particularly easy exercise. There are many species and many of those are similar to each other. Reading about how one species is separated from another very similar species usually gets very technical very quickly, and sometimes I just zone out or give up. Sometimes, even when the descriptions use words I understand, they use those words in unusual ways, and I end up even more confused. 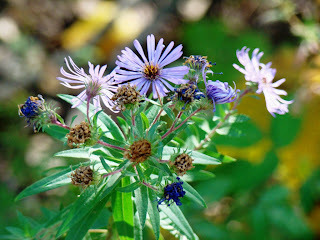 I love knowing what species of all plants are found around Roundtop, but I’m not about to make myself crazy over it when I can’t. Not knowing doesn’t diminish my enjoyment of their beauty. Nothing could do that.